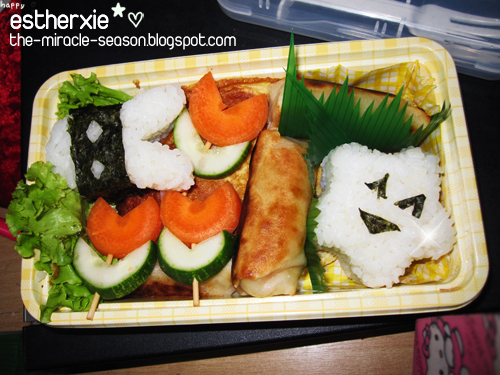 Researched and read alot of bento blogs, and made some of my own bentos! Mine are not the authentic japanese kind. Just chinese food decorated to look like bentos. And my recipes are very easy too! I definitely dont belong to the kitchen - i get failure dishes more than successful one, so this venture into bentomaking sort of scared my boyfriend abit. haha. 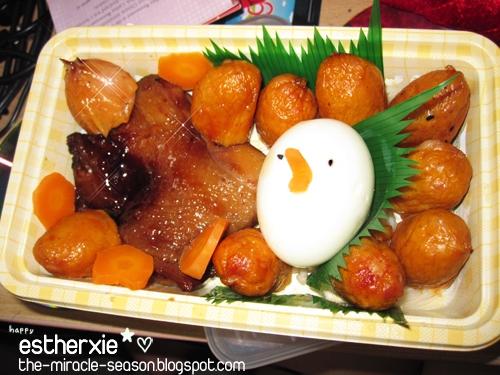 But he saw the bentos i made and liked it so far, requesting me to make everyday. Lol. Went to daiso the other day to buy the supplies. Items are $2 each but after i added up all my purchases, it's actually alot of money! 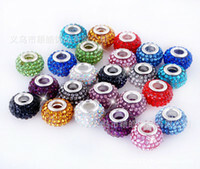 Guess im easily tempted into buying cute things. Aiya, $2 only, take all shapes and size lah. Wah cute. I think i need it. 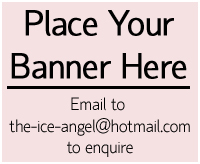 This one also nice, add it in. Omg, SOOOO cute! I want. This one was a flop. I used a mini plastic microwavable rice cooker to cook the first batch of sushi rice but dont know why it kena burnt. haha. And so, i made do with no rice! I boiled an egg in water till it hardens, then i poke 3 holes into the surface. Added the beak (carrot), and eyes (sesame seed). Carrot slices. Just random round carrot slices. This time i cooked the rice using mum's rice cooker. Spilled some rice on the floor cos i accidently placed the whole opened rice bag upside down. Lol. So stupid. I was lazy to sweep it up so i shoved all the grains to one corner. However alot spilled, so with every stepl, you get one grain stuck to your feet. Mum called to nag at me that day. Haha. you can't see it but there's fried egg underneath. Firstly, break an egg, beat it, add some salt and soysauce. Cut up a piece of ham into slices and add it into the egg. Afterwards, pour the egg into the pan and there you have, Fried Ham and Egg. easy lah, buy the packet ones from supermarket, and fry. I used 3 in this bento. Put the rice into cute moulds and out come rabbit and a star! Made the rabbit a bandit by covering it's eyes with a strip of black seaweed. Used the seaweed to make the expression for the star. Doesn't it cheer you up? I had cupcakes paper under it to soak up the oil of the egg, and also lettuce to add colour. Also cut up carrots and cucumbers, and poke it together with toothpick, and there you go, 3 flowers! Used grass dividers again. Used a rice mould to make the rice into circle shape. Decorated it with seaweed facial expression, and hair. After placing the ball into a cupcake holder, i cut carrot to make a headphone for it. That's fried pork. I used chicken seasoning (packets can be found in supermarkets). You just have to marinate the meat with the seasoning according to instructions, and then fry it. Decorated it with cucumber skin. Cut up a piece of taukwa (that was soaked in saltwater overnight) and then slicing in the middle of it to make an opening for the ham pieces. Fry. Carrot flowers and grass dividers. This bento meal wil definitely be filling. Cos the taukwa makes you really full. Using heartshape mould. 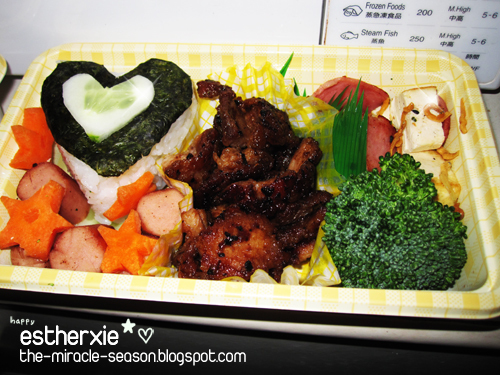 Covered the top with heartshape seaweed and added a smaller piece of heartshape cucumber. one piece of hotdog cut into smaller pieces, fry. Decorate it with star carrots. That's black pepper pork. It's fried pork added with black pepper sauce. Leftover taukwa and ham that couldn't be fitted into bento#3. Added some fried baby ikan billis. Will be going to the vivo branch of Daiso soon to see if there's more cute boxes or decorations i can buy :D I wanna buy seaweed puncher so that i dont have to cut the expressions out. 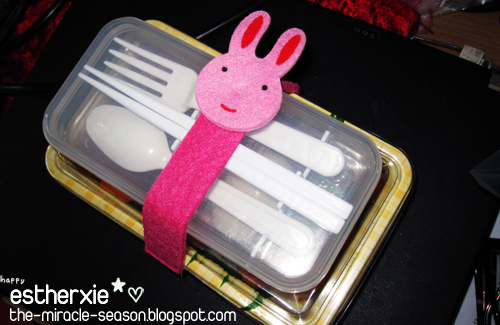 Used this rabbit belt to secure the bento box and the utensils box together. I wanna buy another design on my next visit to Daiso. Everyday see rabbit also will sian mah! 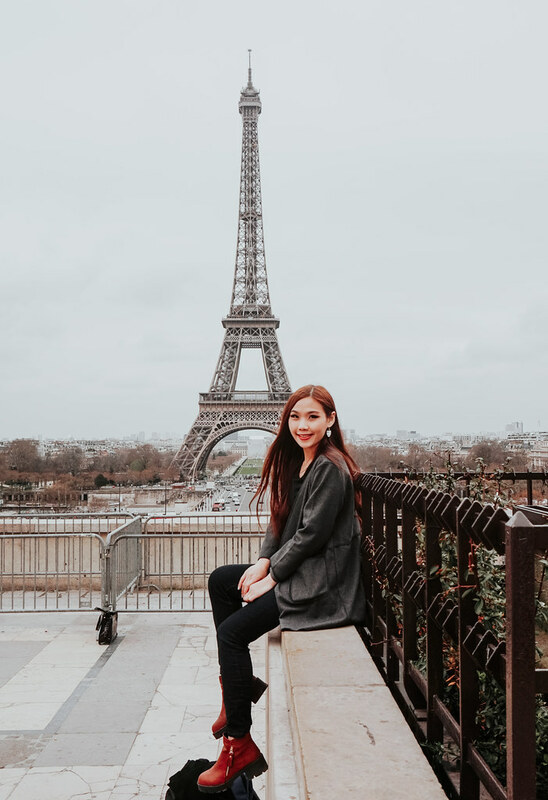 Although my decorating skills are not really good, but I think my recipes are all very easy, you can make it too! But then i used 1 hour+ to make each bento. Gosh! Do you like my bentos? Which bento do you all like best? 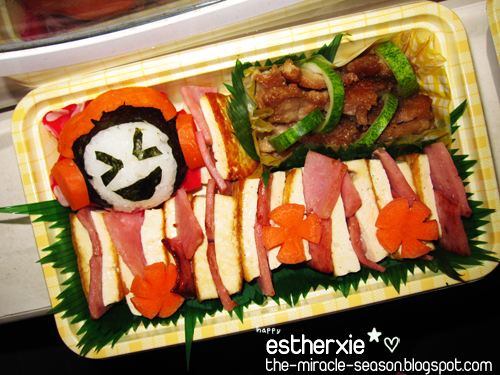 If you all like it i'll blog more of my bento recipes and pictures!